Owen still insists on riding standing up. But the puggles don't mind. Hiking up a trail with Daddy. ...Who both welcomed sister Fiona with open arms. We followed the trails together as a pack. And loved seeing our babies so happy and free in the wide open space. Yes, that is one happy dog! In the water, they played carefree. And were happy as can be. ...How all dogs should be. 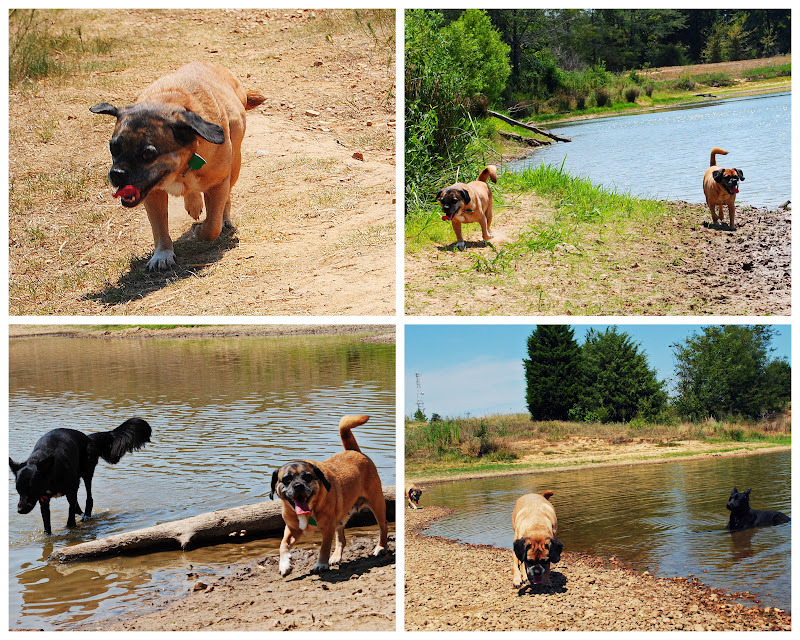 I came across these photos from the day Sean and I took the dogs to the Shelby Farms off-leash park at the end of summer. After seeing the images of how happy our dogs are and thinking back to how well-mannered and friendly they were with every person, dog, and child that passed, I was sad knowing that not all dogs are that way. Not all humans give them the chance to be. Two of the softest spots in my heart belong to my dad and my dogs. Both of those spots have been a little heavy this week thinking about them. While standing with Aussie, the family Australian Sheppard, on the leash in the front yard before church, a forceful blow to the back, in the form of a neighbor's apparently vicious dog, knocked dad to his knees on the sidewalk before either of them even knew he was coming. The attack on Aussie that followed was a nightmare, stopped only by dad's determination to keep Aussie alive. The natural strength of the pit bull was no match for Aussie and with a death-bite on his neck, the outcome could have been heartbreaking. Dad was eventually able to pry his mouth open but the attack continued. Dad laid over the dog in the street, and a neighbor finally heard him yelling for help. Whether Aussie survived or didn't wasn't determined by the severity of the attack, but the courage and strength of his owner. The vicious act is the same regardless of the outcome. Danger is danger. And I pray that danger doesn't arise again with other dogs, neighbors, or the children at the home daycare next door. I wish every dog's home was loving and disciplined, but until then, I pray for safety. Join me in that.